Marleen Bussma was raised on a small farm in North Dakota where horses and cows were a big part of her daily life. As a young girl raking hay with a team of horses and herding cattle on horseback, her imagination was stirred to want to be just like Dale Evans. 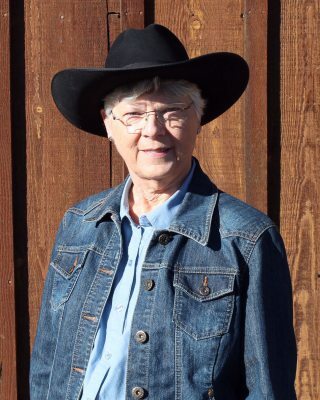 Farm stories and intriguing tales of the old west have had a big influence on her writing. She has put together verses on the plight of the women of the west from frontier days to modern farm and ranch times. Her current book, Is She Country?, was named the Western Music Association’s 2016 Cowboy Poetry Book of the Year and also won the Will Rogers Medallion Award for excellence in western literature. Her latest CD, Saddle Up for Cowboy Poetry, was a Western Music Association finalist for the 2017 Cowboy Poetry CD of the Year. She received the 2017 Georgie Sicking Award for her poem, Market Day, that exemplifies the working cowboy. Marleen has been an invited performer to the National Cowboy Poetry Gathering in Elko, NV and has recited poetry at gatherings from AZ to ND. She is retired with her husband Vaughn and lives in Dammeron Valley, UT. His four feet pound the thirsty dirt that paints the fence posts gray. The wind weaves fingers pulling through his mane and tail’s display. while teasing thoughts of freedom flicker, fade, then fall behind. his actions like a wild stallion flaunting fearlessness? This craving for a life untamed is all he will possess. the bonds that separate him from his distant past. himself back through to early years when horses all ran free. Their bands ran with the elk and bison nursed by liberty. The endless prairie fed them while their numbers gained and grew. with man and fate that shaped their world and set the modern stage. Does this horse know his brothers still run free through desert sage? The barriers and fences work to keep his dreams repressed. Though conquered, tamed and tethered, he’s an icon of the west. 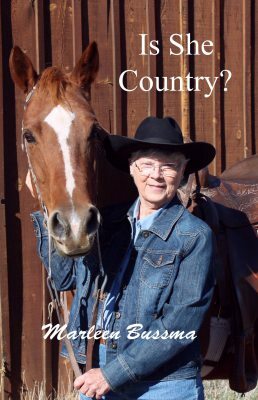 Marleen latest book of poetry, Is She Country? , has 35 poems about stories of the west, old and new. 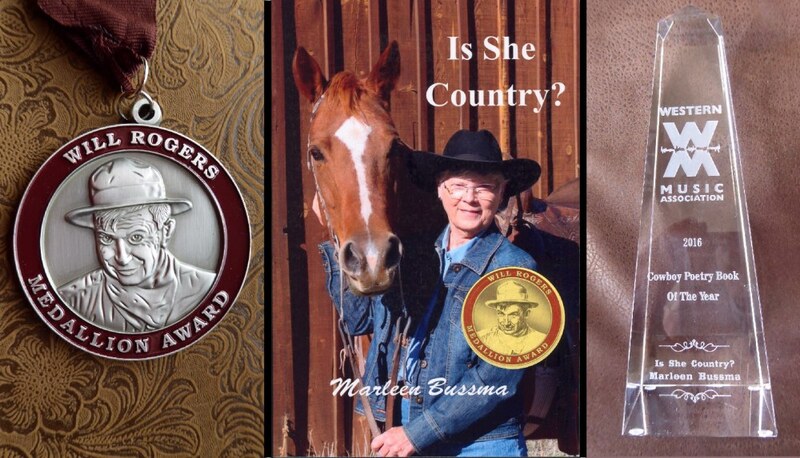 Her book was named the 2016 Cowboy Poetry Book of the Year by the Western Music Association. Some poems are nuggets mined from history and deserve one more telling. Others share the country way of life from the cowboy working cattle in miserable weather to the life of the ranching women working beside their men. To get your copy see her website at www.marleenbussma.com. Marleen will send an autographed book, $13 postage paid. In her book, Is She Country?, Bussma often works with historical figures and visions from past and present. The majority of the collection is done in sort of a “Casey At The Bat” rhythm. But one work (“Slow Burn”) is notable due to an intentional break in the pattern as a set-upon ranch wife contradicts in rebellious prose her husband’s rhythmic, rhymed edicts. In “White Out” a stagecoach emerges from a blizzard with its driver frozen in place. Another stagecoach verse “Old Joe” comes with an O. Henry-worthy twist. Recommended. Marleen's book was very successful, winning two awards in 2016.